Confiding in Manchester United‘s supporters in his programme notes sometime early in 1999, Alex Ferguson compared pursuing three trophies at once to the old circus art of plate spinning. And while there were countless wobbles in what would ultimately be a glorious campaign for Ferguson and United, we seldom came closer to the metaphorical pile of smashed crockery than one unforgettable night in the middle of April. 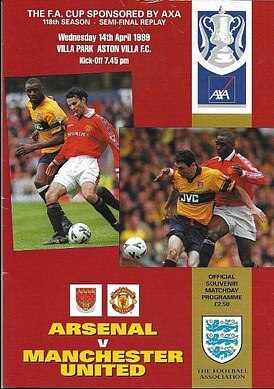 Back in 1999, meetings between United and Arsenal had started to acquire that titanic quality that would endure for the best part of the following decade. By some distance they were the best teams in English football as the 20th century drew to a close. Arsenal were managed by the professorial, pioneering Frenchman, Arsene Wenger. They boasted the same formidable back line that had steered them through the Nineties, the midfield engine of Patrick Vieira, the legs of Marc Overmars and the effortless class of Dennis Bergkamp. United, led by Ferguson, a manager of power and pedigree, had the colossus of Peter Schmeichel in goal, the miserly Jaap Stam in defence, the warrior Roy Keane in midfield, the craft of Ryan Giggs, David Beckham and Paul Scholes, the free-scoring partnership of Andy Cole and Dwight Yorke. The club had won four of the first five Premier League titles before Wenger’s Arsenal emerged to deal them a bloodied nose in winning the Double of league and FA Cup in 1998. Now it was the business end of another season and, when Arsenal and United were drawn together in the semi-finals of the FA Cup, the stakes could not have been higher. By the time of the contest, United had a one-point advantage over Arsenal at the top of the Premiership with eight matches to play. 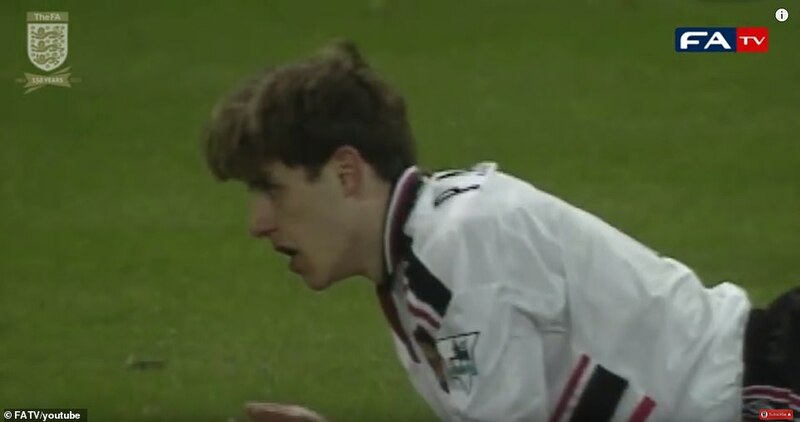 The semi-final also fell between the two legs of United’s Champions League semi-final with Juventus – another late-Nineties nemesis – with the first game drawn 1-1 at Old Trafford. Arsenal were out of Europe but it was very much Double or quits. For United, it was Treble or bust. To call it a pivotal, season-defining fixture was putting it mildly. The first game, played at Villa Park in Birmingham on Sunday April 11, ended in stalemate after 120 uncompromising minutes. 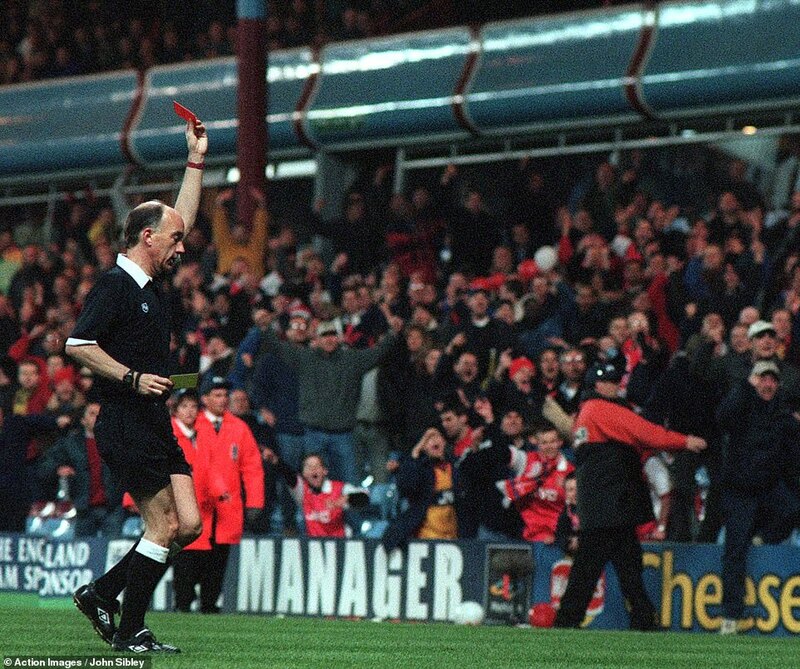 United felt they should have won – Roy Keane saw a first-half goal disallowed and chances came and went after Nelson Vivas collected a second yellow card five minutes into extra time. We were still some way from semi-finals being staged at Wembley all the time – typically Villa Park and Old Trafford played host. So they reconvened three nights later at the same venue for what was to be the last-ever FA Cup semi-final replay. It would turn out to be perhaps the greatest game of the greatest rivalry of the greatest era in the Premier League years. The first surprise came on the teamsheet. Ferguson, spinning those plates with an eye on Turin the following week, dropped his flagging strike pairing of Yorke and Cole. 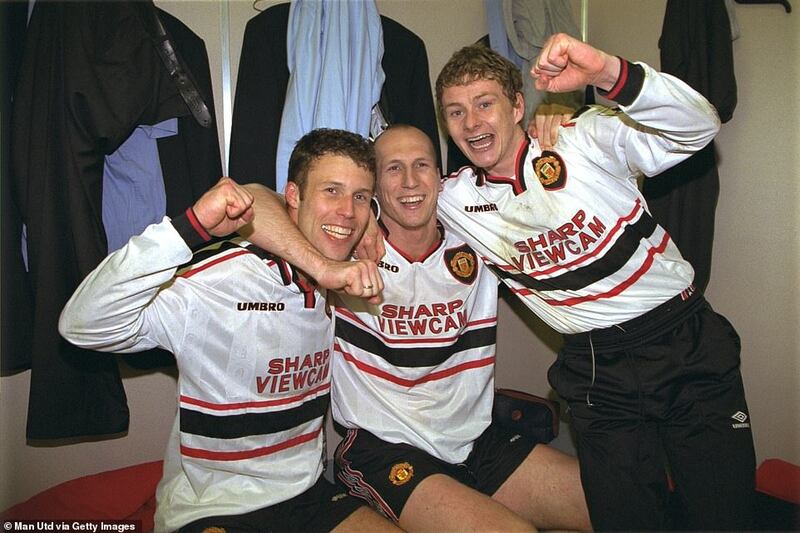 In came uncomplaining back-up brigade Teddy Sheringham and Ole Gunnar Solskjaer. Also on the bench were Giggs and Scholes. United’s flow was unaffected, they started the better and led on 18 minutes. Sheringham was heading down a cul-de-sac with three red Arsenal shirts around him, but managed to cut the ball back to Beckham. Beckham, whose season was a tale of redemption after becoming public enemy No 1 following his sending off for England against Argentina at the World Cup, had no other thought but to shoot from 30 yards. It was immaculately struck, the curl taking it beyond the reach of David Seaman and just inside the post. It was always going to take something special to breach an Arsenal defence that hadn’t conceded in 690 minutes and there it was. 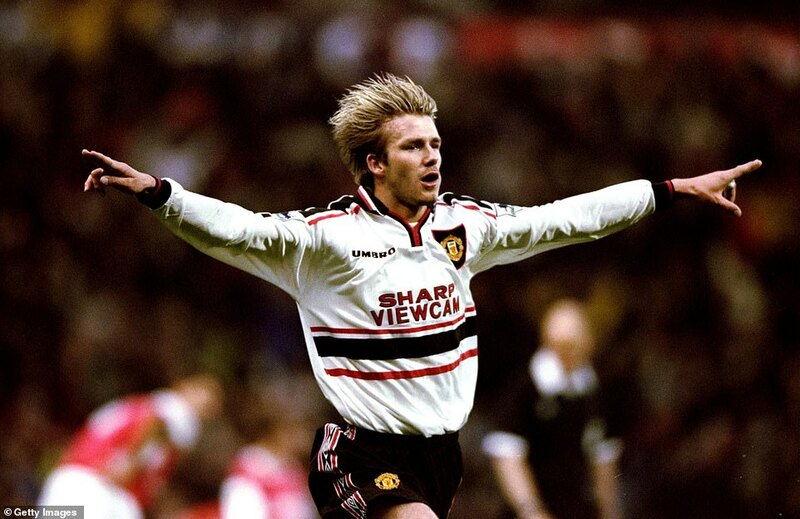 Beckham, all baggy shirt and blonde highlights, just ran and ran in celebration until his team-mates caught up with him. United bossed the game until the hour mark with Solskjaer and Jesper Blomqvist spurning excellent chances to settle the game early in the second half. Then the momentum dramatically shifted. It took a stroke of fortune to haul Arsenal level. Bergkamp spun away from Keane and took aim from distance. 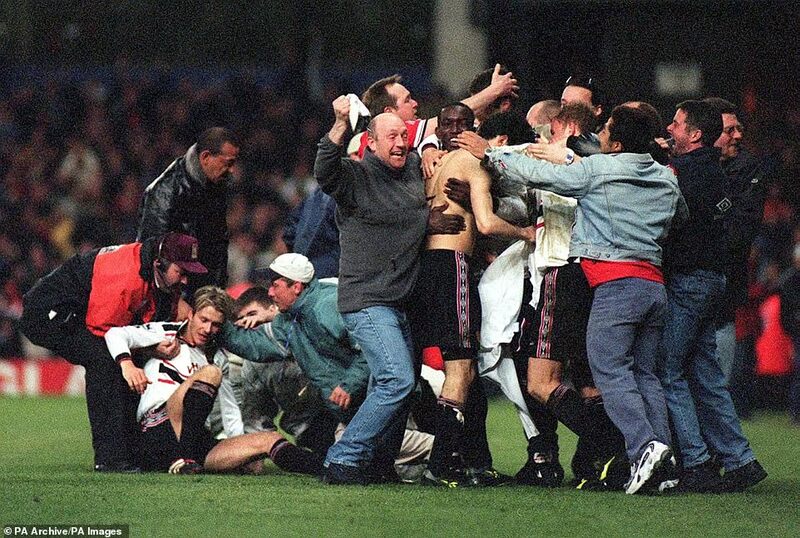 His shot struck Stam on the knee, altering its trajectory completely to wrongfoot Schmeichel. Bergkamp let out a guttural roar and celebrated with clenched fists. The cruel deflection rattled United. Three minutes later and another Bergkamp shot was uncharacteristically spilled by Schmeichel, allowing Nicolas Anelka to take the ball round him and score. Celebrations were quickly cut short by a raised linesman’s flag. Anelka’s jubilant expression melted away into utter frustration, but he had been standing offside. 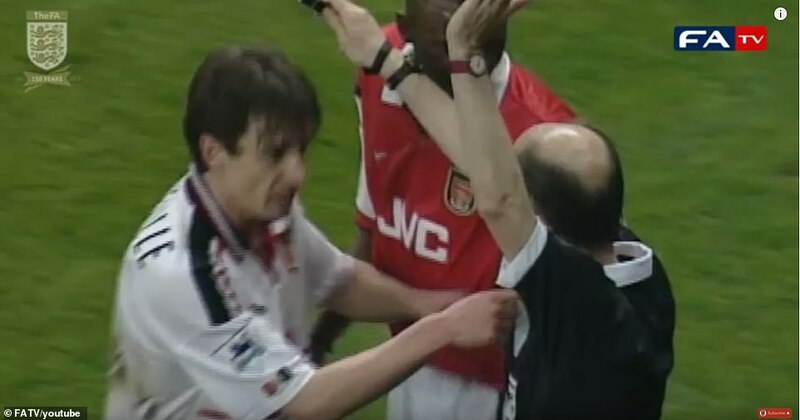 Gary Neville pursued referee David Elleray to make absolutely sure the goal wasn’t going to count. Sky were still showing replays of the disallowed goal when Keane hacked down Marc Overmars and was duly shown a second yellow card. Keane didn’t even acknowledge Elleray, walking a gauntlet of jeering Arsenal fans as he headed directly for the tunnel. Suddenly, United’s Treble chances were dangling by a thread. And especially so in injury time when Phil Neville clumsily brought down Ray Parlour inside the box. Penalty. 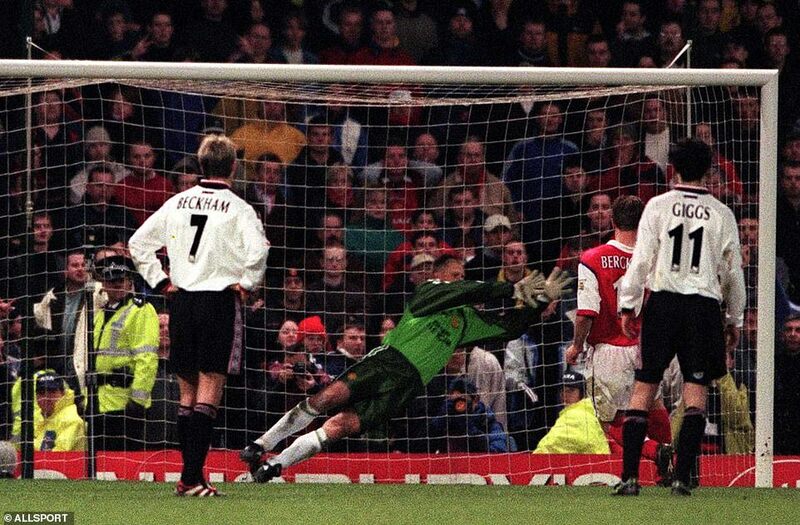 Bergkamp had scored 21 of his 23 career penalties before this point. If he made it 22, United wouldn’t have time to respond. 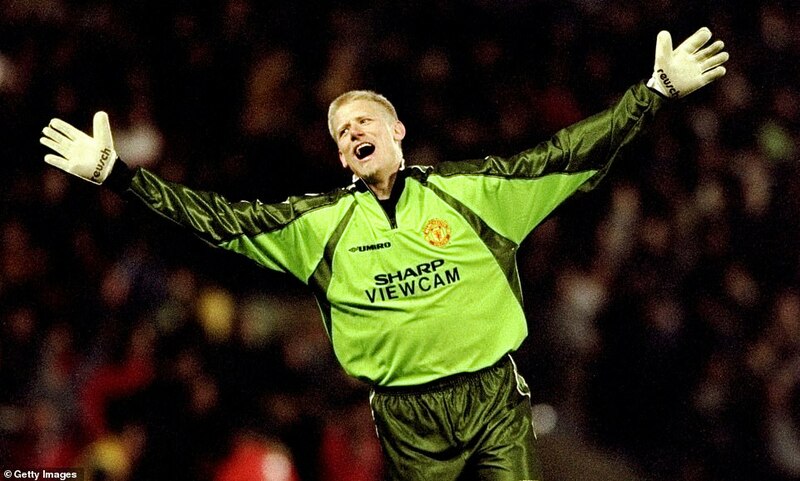 Not that Schmeichel had quite grasped the importance of the moment. 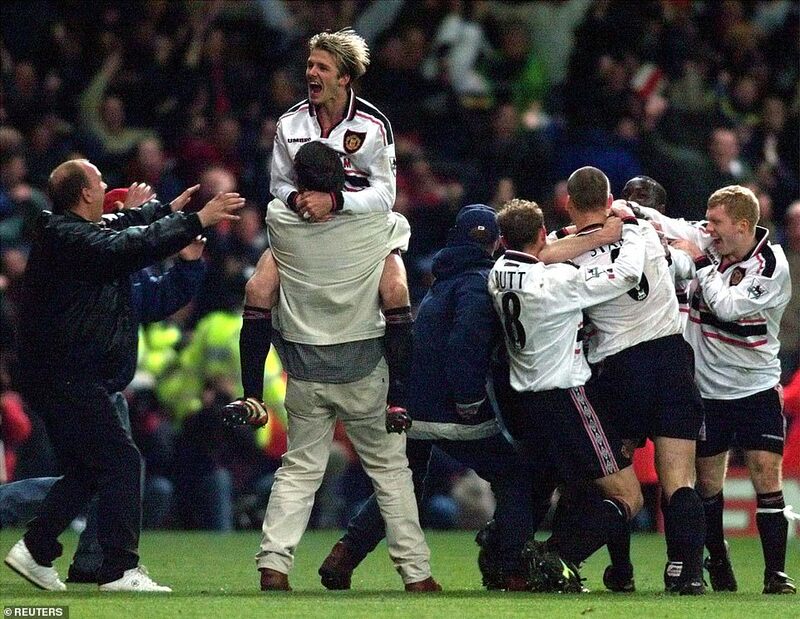 Schmeichel gambled correctly, diving to his left to repel Bergkamp’s kick, before aggressively shoving aside a thrilled Beckham who’d come to celebrate with him. Bergkamp never took another penalty in his career. But at the time, as a pulsating game entered extra time, it was very much advantage Arsenal. Ferguson had thrown on Giggs, Scholes and then Yorke to retain United’s attacking edge, but given their numerical disadvantage, the game plan was very much to get to penalties. 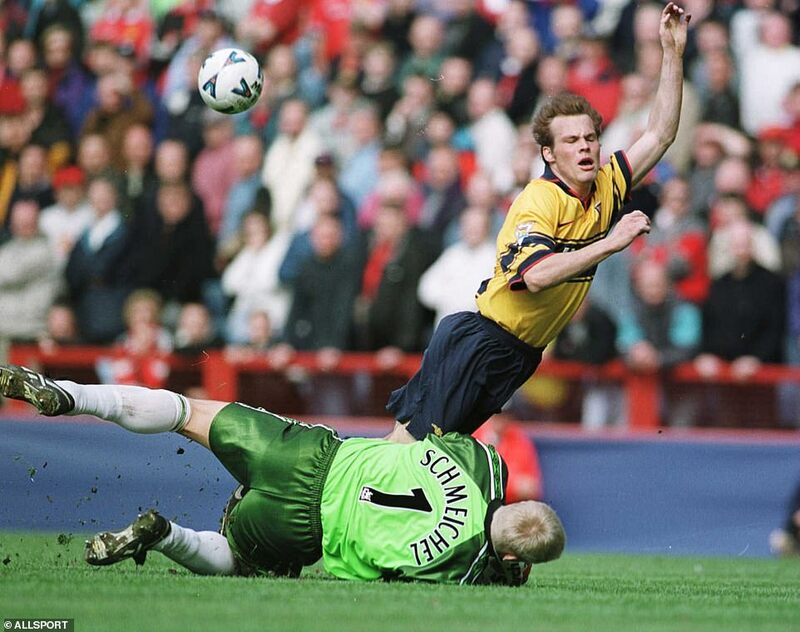 Things looked ominous when Schmeichel tweaked his thigh saving a Bergkamp shot at full-stretch in the 94th minute. It led to the spectacle of Gary Neville taking his goal kicks, a moment of comedy amid the chaos. And, boy, would he be proved right. The Villa Park clock read 109 minutes when Vieira, of all people, played a loose ball across midfield just inside United’s half. Giggs, fresh-legged having come on just after the hour, pounced. ‘I kept saying, “Pass it! Pass it!” recalled Ferguson. ‘At that time we were saying, “Keep the ball”. Our main thought on that bench was, “Hold the ball, keep it, kill time”. It’s just as well Fergie’s voice didn’t carry because we could have been deprived of arguably the greatest ever FA Cup goal. Hell, one the greatest goals of any football match ever. Off he went, United’s fleet-footed No 11, from 10 yards inside his own half, tacking slightly right to avoid Lee Dixon and then body-swerving Vieira who came back at him. 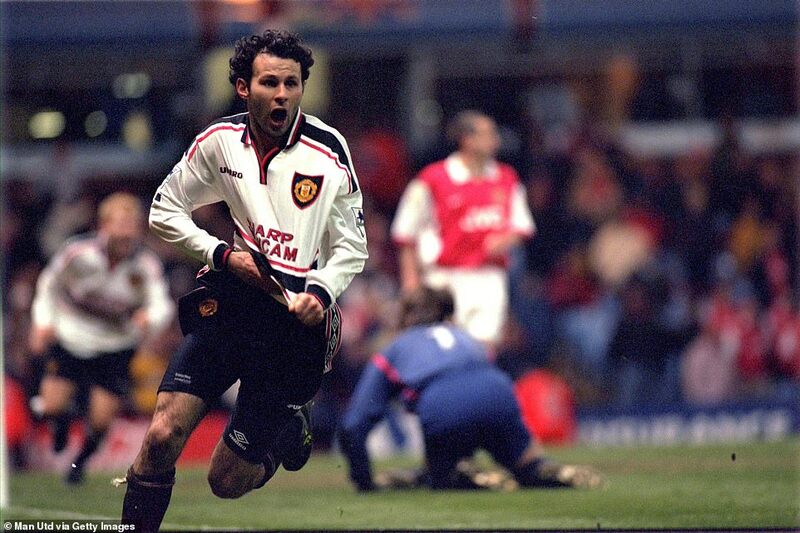 By the time Dixon’s alarm bells started ringing, Giggs had slipped his way between him and Martin Keown, who was left on his backside. 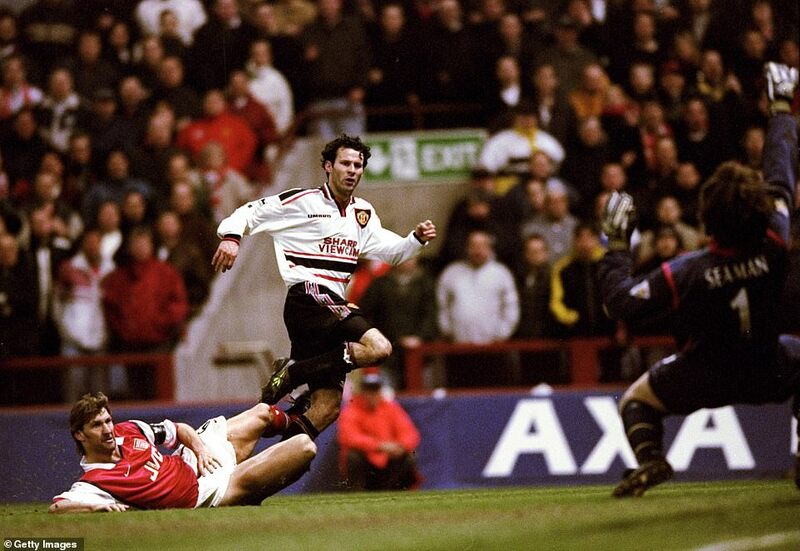 Tony Adams lunged towards Giggs as he shaped to shoot but it was too late. The shot was like an arrow, high over Seaman and into the net. Straight in at No 1 in the hit parade of football’s greatest goals. Well, maybe. 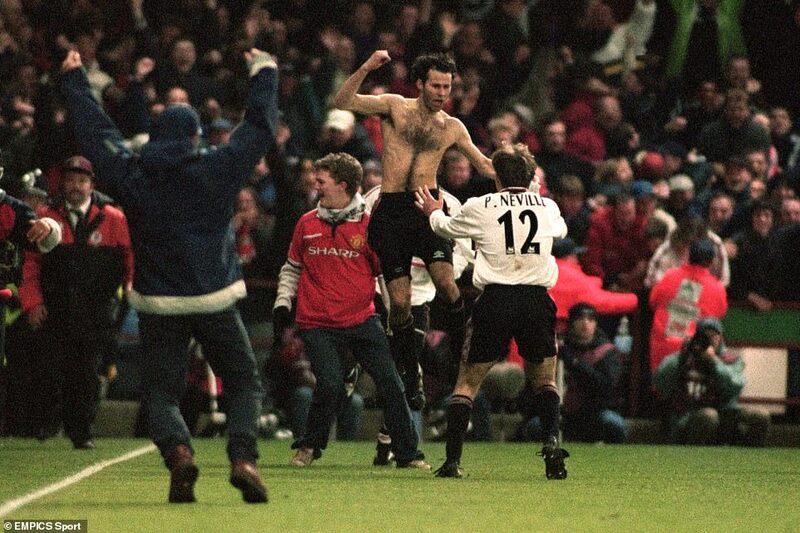 Keane later described how he believed Giggs was in a kind of zen-like trance, playing ‘the way you did when you were a kid on the streets when there was nothing at stake except, in some vague way, personal vindication’. Perhaps that explained the celebration. 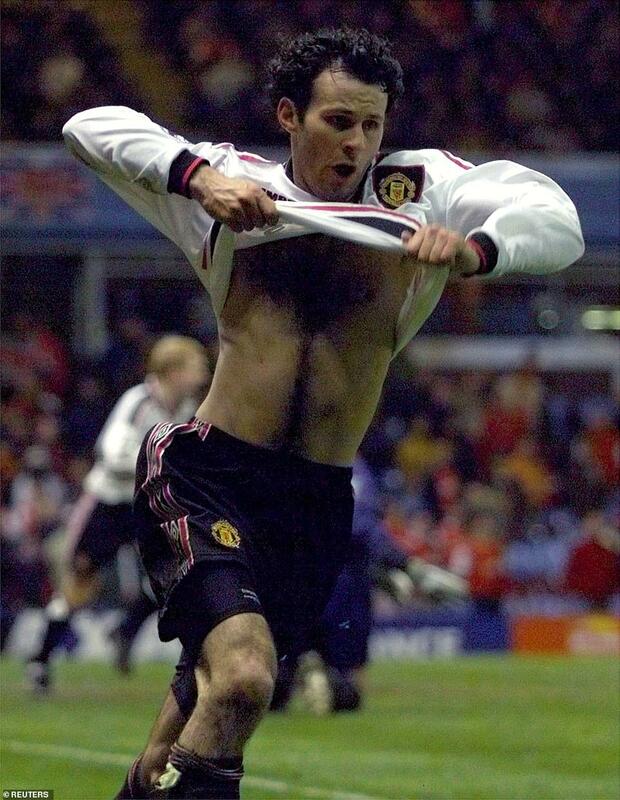 Giggs whipped off his shirt to reveal a rug of a hairy chest, twirling his kit around his head as delirious United fans stormed the pitch. ‘It was the worst celebration I’ve ever seen in my life,’ said a sour Dixon. ‘I think that goal won them the Treble because, if Bergkamp scores, I think the game is over. That goal was certainly what decided their season,’ said Wenger some years later. After United saw out a breathless final few minutes to triumph, the man of the moment didn’t appreciate the magnitude of what he’d done. ‘Coming out the stadium a few of the reporters said to me, ‘Is it the best that you’ve ever scored?’ Giggs said a few years later. ‘And I was wondering what the fuss was about really because I thought after the game that I had got the ball maybe 30 or 35 yards out. The scarcely believable nature of United’s victory seemed to make them invincible for the season’s final furlong. They triumphed 3-2 away to Juventus, fighting back from two goals down. They took the Premier League title by the skin of their teeth from Arsenal on the final day and then beat Newcastle 2-0 in a one-sided Cup final. Four days later, stoppage-time goals by Sheringham and Solskjaer defeated Bayern Munich in miraculous fashion in the final of the Champions League to complete the Treble, something never achieved before by an English club. And somehow, the plates stayed intact.